“No IoT without Artificial Intelligence” – The real value of IoT is about delivering insights and providing new business outcomes. In order to derive actionable insights, you need to analyze the data (from sensors and multiple other sources). Data in IoT context can be broadly classified into 4 types – structured data (a sequence of data or time series information from sensors), unstructured data like images from cameras or drones, a combination of structured and unstructured data, like in case of augmented reality where you superimpose images and text to derive an outcome and fourth being behavioural data where devices learn from interactions, the cognitive aspects of the devices. Each of these use cases requires separate architecture and algorithms and based on the use cases, the computation need to happen on the Edge, cloud or an hybrid approach. For instance, if your use case is around security and surveillance, you would employ computer vision technologies at the edge for processing and analyzing the images locally as it doesn’t make sense to stream the data over the cloud (in such cases, around 99% of the data would not be required). For employing computer vision technologies at the Edge, you can use technologies like deep learning at the edge. As part of the IoTShow (iotshow.in) event, I delivered a technical talk, where I used various use cases on how to infuse intelligence while creating connected products using technologies like deep learning, machine learning, natural language processing and cognitive iot. I will post the video once available. 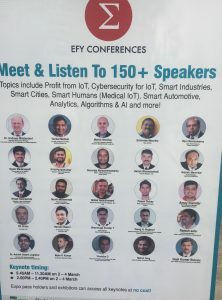 Thanks to EFY for inviting me to present the technical talk.